mommy's reviews: TODAY ONLY! 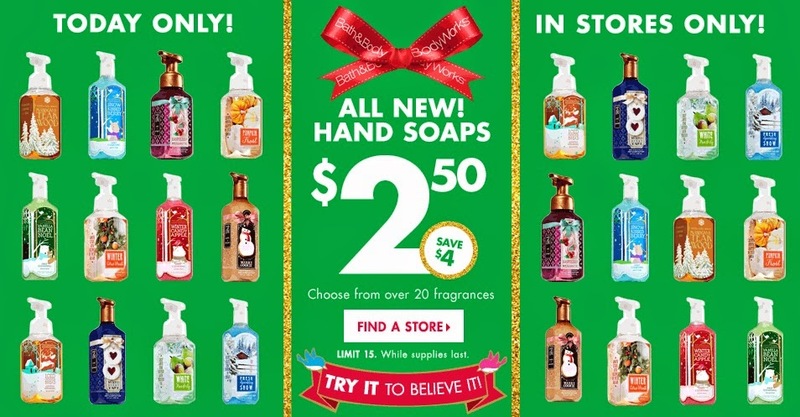 $2.50 Hand Soaps at Bath and Body Works! I LOVE Bath and Body Works hand soap. I always buy soap for the season and love the scents. If you are like me, then you are going to LOVE this deal. Today only, in stores only, you can get the Hand Soap for just $2.50 each! That is a great savings so stop by a store today and stock up on your favorite scents.